An English poet turns a French poem from a sonnet into a douzain. 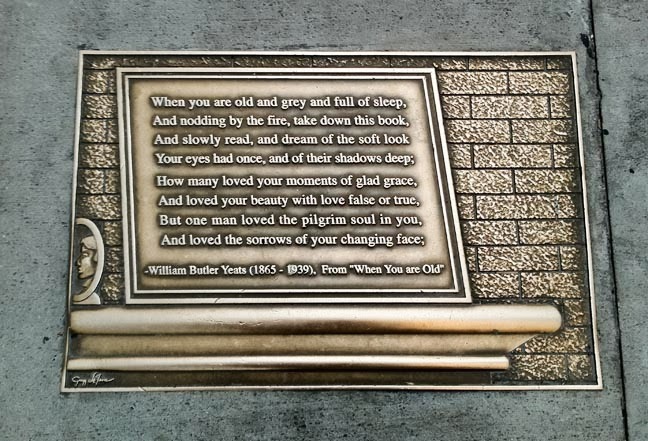 From the original 14-line poem to a 12-line poem, When You Are Old, becomes an eight-line poem as it appears on New York's Library Walk with only the first two verses cast in bronze. Written in 1892, while William Butler Yeats was still in his 20s When You Are Old, is an adaptation of a French sonnet by Pierre de Ronsard. Whereas Ronsard's poem, Quand vous Serez bien Vieille, was written for his muse — Hélène de Surgères, Yeats' interpretation is for his own muse — Maud Gonne. Whether it be a birth day, anniversary or publication date of a seminal work, the Bar None Group will revisit these 40+ quotations from time to time — quotations that inspire one to write, read, explore and embrace literature. We last visited Henry David Thoreau...in a roundabout way.